But then they said they [the shamans] had messengers, to go from here to Old Harbor, or Karluk, or Larsen Bay. And they travel as a ball of fire. They call them keneq íyaq (fire devil). 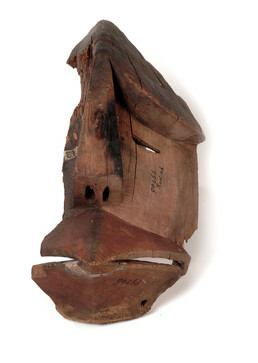 This mask has a birdlike mouth and the pointed head of a dangerous being called an íyaq on Kodiak Island and a kaláaq in Prince William Sound; today’s elders translate these words as “devil.” An íyaq was the soul of an evil or insane person who had died five times and was said to be hungry for meat or human flesh. An íyaq could be used by a shaman as his helping spirit to spy on distant events, to carry messages, or to carry him to other worlds. Owls, cranes, and other birds also served as shaman’s assistants, perhaps explaining this mixed being’s pointed beak. The mask has been partly burned, perhaps to destroy it after a shaman’s ritual or hunting ceremony. So yeah, as beautiful and elaborate as the mask was, they would burn it . . . and as a result of this kind of tradition, not too many Sugpiaq masks have survived. So, that’s why there’s not too many Sugpiaq masks in collections, even around the world. But, we do have some masks, and I think they are here for us to learn from today. Andrew Abyo: Let’s see, some tools that were used were like clamshells, clamshells can be used as carving tools, very sharp of course and can you imagine a beaver’s tooth? . . .
Andrew Abyo: Depending on if it’s from the Aleutians Islands and the Unangax^ people, but this is a Sugpiaq mask, the Sugpiaq, there were some places where there were no trees. And so they used everything from driftwood, including masks, kayaks, visors, even the housing structures was all driftwood. Yeah let’s see. But there are some regions where the Sugpiaq people have access to trees. Andrew Abyo: And of course ochre, which is like a type of rock, pound in. Let’s see for blue they could use the gall bladder of a duck, which is actually blue. [From the Smithsonian Spotlight public talk and individual discussion with Andrew Abyo hosted by the Arctic Studies Center at the Anchorage museum on 10/06/2011. Also participating: Aron Crowell, Dawn Biddison and Monica Shah (director of Collections, Anchorage museum). Sven Haakanson, Sr.: If you could find some of them [masks], a lot of people knew where there were caves [with masks]. I think Costia Inga and some other people. But they reburied them, because they didn’t want people to bother their ancestors. And they still look for all those masks. They had masks for different occasions – for weather, for fishing, for hunting – their ceremonies. . . . If someone was sick, they would take certain masks to ward off evil spirits and stuff like that, just the same. John Johnson: From talking to various people, I think a lot of these masks were used for various dance ceremonies. And then as the individual dies, these masks sometimes were placed with the dead when they passed away. And we find all different types of masks like that.